L'Era del Celdoni is a sparkling blend of Parellada, Macabeu and Chardonnay from vineyards over 50 years old in Argilo-Calcareous lands. Sparkling light aromas because of the main variety, the Parellada. In the mouth creamy bubble, with good acidity and almond notes in its final argo. 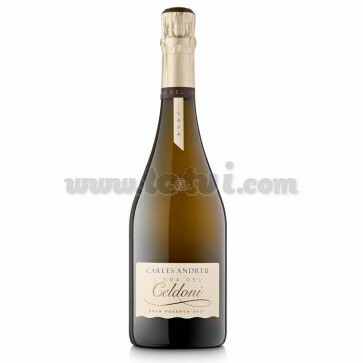 L'Era del Celdoni is a sparkling blend of Parellada (80%), Macabeu (10%) and Chardonnay (10%) from vines over 50 years old in argilo-calcareous lands. Straw yellow color very bright, the bubble is fine and persistent in the glass. In the nose we discover the universe of light aromas of the main variety, the Parellada, such as pear, gooseberry and fonoll in combination with the aromas of long aging, such as brioix, orellana and some notes of toffee. In the mouth the bubble is creamy and precedes the dry tastes and the good acidity identified as apple, grapefruit and pineapple of moderate intensity that merge with the pastry and the almond notes of its long end. Ideal to accompany seafood, fish and cold meats.